بیرامی, منصور, نظری, محمدعلی, هاشمی, تورج, موحدی, یزدان. (1396). اثربخشی درمان توانبخشی عصب- روانشناختی بر عملکرد توجه مستمر در دانش‌آموزان با اختلال ریاضی شهر تبریز. 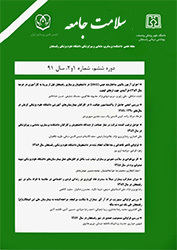 سلامت جامعه, 10(3), 45-52. منصور بیرامی; محمدعلی نظری; تورج هاشمی; یزدان موحدی. "اثربخشی درمان توانبخشی عصب- روانشناختی بر عملکرد توجه مستمر در دانش‌آموزان با اختلال ریاضی شهر تبریز". سلامت جامعه, 10, 3, 1396, 45-52. بیرامی, منصور, نظری, محمدعلی, هاشمی, تورج, موحدی, یزدان. (1396). 'اثربخشی درمان توانبخشی عصب- روانشناختی بر عملکرد توجه مستمر در دانش‌آموزان با اختلال ریاضی شهر تبریز', سلامت جامعه, 10(3), pp. 45-52. بیرامی, منصور, نظری, محمدعلی, هاشمی, تورج, موحدی, یزدان. اثربخشی درمان توانبخشی عصب- روانشناختی بر عملکرد توجه مستمر در دانش‌آموزان با اختلال ریاضی شهر تبریز. سلامت جامعه, 1396; 10(3): 45-52. 1استاد، گروه روانشناسی، دانشگاه تبریز، تبریز، ایران. 2دانشیار، گروه روانشناسی، آزمایشگاه علوم اعصاب شناختی، دانشگاه تبریز، تبریز، ایران. 3دانشجوی دکترای تخصصی علوم اعصاب شناختی، دانشگاه تبریز، تبریز، ایران. مقدمه: اختلال در ریاضیات عبارت است از ناتوانی در انجام مهارت­های مربوط به حساب با توجه به ظرفیت هوشی و سطح آموزشی که از کسی انتظار می­رود. پژوهش حاضر نیز با هدف تعیین اثربخشی درمان توانبخشی عصب- روانشناختی بر عملکرد توجه مستمر در دانش­آموزان با اختلال ریاضی انجام شد. مواد و روش ­ها: طرح پژوهش حاضر به صورت نیمه آزمایشی با دو گروه آزمودنی بود. جامعه آماری پژوهش حاضر شهر تبریز در سال 1395 بود، و نمونه مورد نظر از مناطق پنجگانه اختلالات یادگیری انتخاب شدند. روش نمونه­گیری به صورت تصادفی ساده بود. بدین صورت که یک گروه 10 نفره شامل افراد مبتلا به اختلال یادگیری ریاضی و 10 نفر نیز شامل گروه گواه بود. یعنی افرادی که مبتلا به ناتوانی یادگیری هستند اما مداخله­ای برای آنها صورت نگرفت. تعداد جلسات درمانی 20 جلسه بود و هر جلسه 45 دقیقه به طول می­انجامید. ابزار پژوهش شامل برنامه کامپیوتری توانبخشی عصب- روانشناختی Sound Smart و آزمون عملکرد پیوسته بود. تحلیل داده­ها با استفاده از تحلیل کوواریانس چند متغیره انجام شد. یافته­ ها: بین میانگین نمره­های پیش­آزمون و پس­آزمون گروه آزمایش و کنترل تفاوت معنی­داری وجود داشت (001/0>p)، به نحوی که توانبخشی عصب- روانشناختی باعث بهبود توجه مستمر در دانش­آموزان مبتلا به ناتوانی یادگیری ریاضی گردید. نتیجه ­گیری: این مطالعه نشان داد توانبخشی عصب- روانشناختی می­تواند به عنوان یک روش اثربخش در افرادی که اختلال یادگیری ریاضی دارند مورد استفاده قرار بگیرد. 1Professor of Psychology, Dept. of Psychology, Tabriz University, Tabriz, Iran. 2Associate Professor of Psychology, Dept. of Psychology, Laboratory of Cognitive Neuroscience, Tabriz University, Tabriz, Iran. 3Ph.D Student of Cognitive Neuroscience, Dept. of Psychology, Tabriz University, Tabriz, Iran. Introduction: Dyscalculia is the disability to perform the skills related to calculation in consideration to intellectual capacity and educational level that is expected from a normal person. The current study was aimed to determine the effectiveness of neuropsychological rehabilitation treatment on the continuous attention function of students with dyscalculia. Materials and Methods: The design of the present study was semi-experimental with two groups of 10 students from Tabriz city in 2016. The sampling method was simple randomization, in which a group of 10 students with mathematical learning disorder were chosen from five regions of the city with learning disorders and 10 students as a control group who had learning disability but without any therapeutic interventions. The case group received twenty therapeutic sessions of 45-minute. The study instrument contained of computer program of neuropsychological rehabilitation (sound smart) and continuous function test. The data analysis was done using the multivariable covariance analysis. Results: There were significant differences between the mean scores of the pretest and posttest of the experimental and control groups (p<0/001), so that the neuropsychological rehabilitation led to promotion of continuous attention in students with mathematical learning disorders. Discussion: This study indicated that neuropsychological rehabilitation can be used as an effective method for people with mathematical learning disorders. Garcia VL, Pereira LD, Fukuda Y. Selective attention: psi performance in children with learning disabilities. RBDO 2007;73(3):404-11. Sadok B. Summary of psychiatry. 3 nd ed. Tehran: Arjmand; 2007:217-25. American Psychiatric Association. Diagnostic and statistical manual of mental disorder. 5 nd ed. American: Routledge press; 2013: 178-208. Lemberg H. The Efficacy of Computerized Cognitive Training in Adults With ADHD: Change in ADHD Symptoms, Executive Functions and Quality of Life Following Three Months of Training. HMOJ 2011; 15(3): 400- 30. DuPaul GJ, McGoey KE, Eckert TL, VanBrakle J. Preschool children with attention-deficit/hyperactivity disorder: impairments in behavioral, social, and school functioning. J Am Acad Child Adolesc Psychiatry 2001;40(5):508-15. Ameratunga D, Johnston L, Burns Y. Goal‐directed upper limb movements by children with and without DCD: a window into perceptuo–motor dysfunction? PRI 2004;9(1):1-12. Seidman LJ, Biederman J, Monuteaux MC, Doyle AE, Faraone SV. Learning disabilities and executive dysfunction in boys with attention-deficit/hyperactivity disorder. Neuropsychology 2001;15(4):544-56. Barkley RA. Attention- Deficit/ Hyperactivity Disorder. A Handbook for diagnosis and treatment.1nd ed. Newyork: Guilford press; 1997; 145-50. Sterr AM. Attention performance in young adults with learning disabilities. LID 2004;14(2):125-33. Gaitán A, Garolera M, Cerulla N, Chico G, Rodriguez‐Querol M, Canela‐Soler J. Efficacy of an adjunctive computer‐based cognitive training program in amnestic mild cognitive impairment and alzheimer's disease: A single‐blind, randomized clinical trial. IJGP 2013;28(1):91-9. Thorell LB, Lindqvist S, Bergman Nutley S, Bohlin G, Klingberg T. Training and transfer effects of executive functions in preschool children. Developmental science 2009;12(1):106-13. Owen AM, Hampshire A, Grahn JA, Stenton R, Dajani S, Burns AS, et al. Putting brain training to the test. Nature 2010;465(7299):775-8. Hadianfard H, Najarian B, Shokrkon H, Mehrabizadeh Honarmand M. Procurement and construction Persian form of continuous performance test. Journal of Psychology 2001; 4 (4): 404-388. Zelazo PD, Müller U, Frye D, Marcovitch S, Argitis G, Boseovski J, et al. The development of executive function in early childhood. MSRCD 2003;68(3):i-151. Gamari Givi H, Narimani M, Mahmoudi H. Software to promote understanding of the effectiveness of executive functions, response inhibition and working memory in children with dyslexia and ADHD. JLD 2012, 1( 2):23-37. [Persian]. Ponce HR, López MJ, Mayer RE. Instructional effectiveness of a computer-supported program for teaching reading comprehension strategies. Computers & Education 2012;59(4):1170-83. Kast M, Baschera G-M, Gross M, Jäncke L, Meyer M. Computer-based learning of spelling skills in children with and without dyslexia. Annals of dyslexia 2011;61(2):177-200. Loosli SV, Buschkuehl M, Perrig WJ, Jaeggi SM. Working memory training improves reading processes in typically developing children. Child Neuropsychology 2012;18(1):62-78. Dahlin KI. Effects of working memory training on reading in children with special needs. Reading and Writing 2011;24(4):479-91. Bakker DJ. Treatment of developmental dyslexia: A review. Pediatric rehabilitation 2006; 9(1):3-13. Casey JE. A model to guide the conceptualization, assessment, and diagnosis of Nonverbal Learning Disorder. CJSP 2012;27(1):35-57. Jenks KM, De Moor J, Van Lieshout EC. Arithmetic difficulties in children with cerebral palsy are related to executive function and working memory. JCPP 2009;50(7):824-33. Kesler SR, Lacayo NJ, Jo B. A pilot study of an online cognitive rehabilitation program for executive function skills in children with cancer-related brain injury. Brain Injury 2011;25(1):101-12. Buchan B D. The classification of reading disability subtypes and the efficacy of hemisphere specific stimulation. Indiana university of Pennsylvania. 1 nd ed. Pennsylvania: California press; 2009: 34-51. Barlow DH, Durand VM. Abnormal psychology: An integrative approach: Nelson Education, 2 Ed. American; 2011: 113-164.